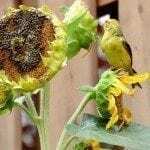 Whether growing sunflowers as a means to attract pollinators or simply to add some vibrant color to the summer vegetable garden, there is no denying that these plants are a long-time favorite of many gardeners. Coming in a wide range of sizes and in subtle shades of yellow and reds, it is sometimes difficult to choose which varieties to plant. Luckily for growers, there are open pollinated and hybrid cultivars of sunflowers that will fit perfectly into most landscapes. As the name would imply, these sunflower varieties are capable of reaching amazing heights, some as tall as 16 feet (4.8 m.)! Giant varieties of sunflower are sure to make a statement when grown in the home garden, as they often grow taller than nearby fences (and sometimes houses). Though beautiful, these large plants will sometimes require staking in regions prone to high winds and strong summer storms. Medium sunflowers are those which grow tall; however, their height is nowhere near comparable to that of the giant sunflower cultivars. Medium sized sunflower varieties can generally be divided into single stem and branching types. While single stems will produce only one flower per plant, branching varieties offer growers more flowers and longer bloom times. Branching varieties offer more color and visual impact for growers who garden in small spaces. Dwarf sunflower varieties are a great choice for gardeners with little space. Often reaching only a few feet in height, many dwarf sunflower cultivars can also be planted in containers or in flower borders. The compact size of dwarf sunflowers allows for a bright pop of color without interfering with vertical growing space. Pollenless sunflowers are a unique option. These pollen-free varieties of sunflower are most commonly grown by those wishing to use their sunflowers in cut flower arrangements. This makes them an exceptionally good choice for growers who want to sell bouquets at farmers’ markets. These sunflower cultivars are extremely uniform and quick to bloom.